In Brief: the best dial test indicators are Swiss made. Take that with a heaping spoonful of salt, however. Even "Swiss" indicators will contain Chinese elements and they may even be assembled in China. As a matter of conjecture, we can suspect that ALL manufacturers now resort to the aid of China in making their gages. Here's the odd part: The worst dial test indicators are Chinese, and - sorry to say - American. We'll let you figure out the manufacturers in question. Accupro vanity dial appears on indicators made in China and Germany. The Chinese indicators are worthless and can not be repaired. The German indicators are the Puppitast series made by Mahr-Federal. Alina (Switzerland) indicators were made by Compac until the mid-1960's. They are no longer available and spare parts are exhausted. The Alina Model 88 indicator was a superior version of the American-made Last Word indicator. Baker (China) indicators are cheap throw-aways for which parts are not available. We have been told that they are somewhat longer lived than other Chinese brands. Replacement contact points are not available but Compac points will fit, in a pinch. Bestest (Switzerland) has become America's favorite and there are good reasons. They're among the very best available; a great value for the money. Excellent repeatability and quick response make them desirable. If there's a drawback, it's that they're prone to damage because of the light construction. Available in black or white, horizontal, vertical or parallel. Except for the name on the dial and the accessories in the kit, they are identical to Tesatast. Distributed in the US by Brown & Sharpe. China If you're buying generic indicators made in China, you're scraping the bottom of the barrel. You can't get any worse. Some years ago we were hired to evaluate these indicators for MSC who wanted to know if they were worth importing. Apparently they didn't listen to our advise. Now, of course, they’re making a killing selling these. Dovetails didn't fit and brand new .0001" indicators wouldn't calibrate. It turned out that dovetails didn't accept anyone else's attachments because they were oversized. Pass on these and order some Take-Out instead (but skip the chicken feet). Available in catalogs everywhere but don’t expect to find any spare parts. CDI (Chicago) test indicators are identical to Compac (Switzerland). These were made for CDI in the 1980's. CDI no longer sells them but you can buy the Compac replacements. Compac (Switzerland) has been our indicator of choice for over 4 decades. These are sturdier than Bestest and less finicky (and less costly) than Interapid, even though they're made by the same manufacturer. Of particular note are the extra long range of some of the models. Model 215GA (.0001") and 225GA (.0001" vertical) have dials with extra wide spacing between graduation marks. This is a feature that many owners appreciate. Dials are continuous reading on long range models, balanced on standard range. Contact points will swivel, like other indicators, but you may encounter more friction than you are used to. It's okay to apply the extra force. The indicator's over-sized pivot can take it. Long Island Indicator stocks new Compac indicators as well as repair parts. Craftsman indicators are sold by Sears but are often times made in the UK in which case they are identical to Verdict indicators. They're not very good (in fact, they're downright awful) but do offer the "pear shaped" contact point which makes them look quite medieval and eliminates the cosine error, in theory. Repairs: why would you want to fix it? Information: if you know something, let us know! EMS (Germany) no information available at this time. Federal Gage made the worst test indicator you could get stuck with. Blobs of solder were used to hold it together. Mercifully these have been discontinued. The last models named Testmaster were made by Tesa in Switzerland and they're identical to Bestest indicators (see above). These are no longer available from Federal, but you can still buy the Bestest equivalent. The newest indicators are called MarTest (see Mahr-Federal). Fowler once relied heavily on English imports such as Verdict indicators. These were about as good as English weather. Nowadays they rely more heavily on Swiss made gages but also offer look-alikes in their effort to remain competitive. Beware of wolves in sheep's clothing: they offer a pathetic imitation of the Bestest indicator and an Interapid look-alike is made in China and sold under the name Xtest. The best mechanical test indicator which Fowler offers is the Swiss made Girodtast. 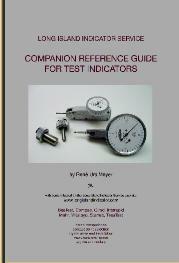 Fowler recently imtroduced Ultra-Tast indicators which are made by Kafer in Germany. It is a respectable manufacturer but has been known to outsource to China. Repairs and spare parts may be hard to come by. A five-year warranty sounds great but it is against manufacturing defects. Any defects would be noticed within the first few weeks of use and not likely after four-and-a-half years. When shopping Fowler, if it doesn't say "Swiss Made" or "German made": Buyer beware. Repairs: limited by parts availability. Ask your preferred repair shop before sending these. Gem (USA) makes an inferior version of the popular Starrett Last Word Indicator. This would be fine if they were cheaper. There is an odd variation, however: one model has two dial faces, one on each side. This comes in handy in some applications. Some of the newest models have replaceable dove tails. Gem also manufactures a line of indicator clamps and holders. Girodtast (Switzerland) is similar to the old style (1970's) Bestest indicator with some improvements to make them sturdier. In the USA these are sold by Fowler. In Switzerland they are also sold with the name SISO-Tast. If you've ever wanted a Bestest indicator with multiple revolutions, Girod offers several models with extended ranges. If they have a drawback, it's that the contact point is adjustable. You'd think this were an advantage, but for most people it's a nuisance. On the Bestest you simply unscrew the old, screw in the new. On the Girod-Tast you have to adjust the new point so that the indicator is in calibration. H.G. Jensen (Waltham, Massachusetts) is an exceptionally basic relic of early test indicator design. If you find one of these, keep it for historical purposes. Hughes Aircraft Company had a patented modification of the Swiss Compac indicator in the 1980s. This allowed it to measure force. It appears that the only modifications to the 214GA model were a stronger return spring, and a custom counter-clockwise dial without a revolution counter. Johnson Gage test indicators of the 1950's and 1960's were made by Compac, Geneva. They were the same as those sold under the Alina brand name (see Alina, above). They are obviously long obsolete. Kafer (Germany) (also spelled Käfer and Kaefer) manufactures a complete line of test indicators with one revolution. These are beautifully crafted and come in a box with a clear lid, so you can easily see what you're taking off the shelf. Alas, they do not have identifying serial numbers. An excellent alternative to Swiss-made indicators but model styles are limited. Parts are available from Germany but rarely does anyone stock them. Kurt (USA) although located in Minneapolis, these are generic made-in-China imports. They're cheap throwaways although Kurt claims they're of better quality than other Chinese indicators. This is possible but we can not verify it. Last Word (USA) Starrett makes this stalwart and ubiquitous test indicator without resorting to toothed gears. Although usually accurate we've seen enough of them that compare poorly with the better built, gear driven indicators to warrant skepticism. The body on older models, being made of iron, rusts easily and will become magnetic (and sticky as a result). Newer models are black anodized. Lufkin never manufactured any of their own indicators. In the 1960's they had a vanity dial on the Alina indicator. These tended to have model numbers such as V60X. It was never clear how they managed to usurp Alina's exclusive rights to these gages and that may have been the reason the line was finally dropped. Repairs are no longer possible due to the obsolete parts. MarTest possibly manufactured in Czech Republic by Mahr but some gages do not show a country of origin which is a pretty sure sign that they come from China. These are modeled after the Mitutoyo design but the bezel is made of metal and less likely to be damaged. These test indicators have the contact point length conveniently inscribed on the side of the case. We find that the .0001" indicators may be too sensitive for some users. The contact point swivels very easily and this can cause problems with repeatabiltiy. The bezel turns on a rubber o-ring and this has sometimes dried out on us creating much too much friction for comfort. Mahr (Puppitast) manufactured in Germany, part of the pre-Mahr-Federal conglomeration. These are structurally similar to Bestest, Tesatast and Girodtast indicators. The handsome bodies are somewhat sturdier and have textured sides which might, under some circumstances, keep them from slipping out of your hands. The crystal can rather easily be replaced without tools and this is an advantage over Bestest and Tesatast. Discontinued. Mercer manufactured in Switzerland and are identical to Compac indicators. All models are discontinued. Previous models were made in England. They are also discontinued. MHC Industrial Supply made in China. Whenever the country of origin is not printed on the indicator dial, you can be assured it's Chinese. For some reason they can get away with that. Mitutoyo new models, completely redesigned in 2017, are manufactured in Japan. Some models are available with optically scannable serial numbers on the dial face. The proper contact point length is now shown on the dial of each indicator. The new "pocket" models 513-512 and 513-518 are a major improvement in design and construction over the old models and can be recommended. The multi-revolution slanted dials which mimic the Swiss Interapid indicator have one significant difference: they are accurate when the contact point is used at an angle of 0°. This could be a source of confusion—and error—in a shop which uses both brands. Because of their often low list price, these are best considered "throw-away" indicators. Repair are likely to be uneconomical. To prove the point, the manufacturer uses epoxy on some of the assemblies, making them virtually impossible to disassemble. Mitutoyo has frequent model updates. Mueller old models were made in England. Nork indicators were manufactured in Manhattan of all places, by General Howe Mfg Co., Inc. They're a dreadful imitation of the Starrett Last Word indicator although they did have a much more functional reversing lever. Parvus indicators were manufactured in Switzerland during the 1940-50's and sold in the US with the Alina name on the dial. These were later transformed into the Compac models. You may see the word Parvus stamped on some of the old bodies. Long obsolete (1950's), there are no parts or repair service available. Peacock (Pic-Test) manufactured in Japan. This is a meager entry in the test indicator market, designed along the lines of the old model Bestest. Comparison ends there, however. Calibration often has to be fudged by changing the contact point angle on the .0001" model. Newer models contain plastic gears. They are available from some catalog houses but parts are generally unavailable. Scherr Tumico (S-T Industries) carries some test indicators made in England and others from China. Sisotast manufactured in Switzerland. This is a vanity dial for the Girodtast indicator. The indicators are identical with the exception of the dial. Parts: not available. Never have been, never will be. Standard Check-Master manufactured in Poughkeepsie, a long time ago. This indicator was like the Federal TestMaster design only much better. It was elegant and beautiful in comparison. Parts and service are no longer available on this long obsolete item. Starrett (USA) would like us to believe that they are products of the USA. Recently released models 3808 and 3809 do not claim to be made in USA and rumor has it that these are of Chinese origin. Models 708 and 709 are "American Made". We have found these to be surprisingly accurate. Construction-wise, none of the Starrett test indicators are in the same league as their European made counterparts. Teclock (Japan) You can often buy European-made models for less, and you'll get better quality. Spare parts are not commonly available. These indicators are heftier but feature an inferior execution of the Bestest-style mechanism. The newest models seem to come with plastic bezels. When the crystals are scratched, or the bezel breaks (it will) you won't be able to replace them. Tesatast (Switzerland but models since 2018 may have Chinese origins) manufactured by Tesa are identical to Bestest with all the same good features. The accessories that come with the indicator are different. We have all parts in stock. Testmaster (USA) an indicator made by Federal Gage and discontinued, mercifully, in the 1970's. This was one of the worst designs and executions of all time. Blobs of solder were used to keep the return spring in place. Unbelievable. Türlen an inexpensive generic test indicator with a fancy German-sounding name made in China by the looks of it. XTest (China) manufactured for Fowler as a rip-off on the high-quality Interapid indicator. They look so much alike in the advertisements that many people are fooled into thinking they're getting a terrific deal on the Swiss indicator. You get what you pay for. In this case, a pathetic imitation. Indicators sold by Long Island Indicator Service can be accessed by clicking on the (brown) linked manufacturer's name. There is typically nothing the user can do to service test indicators other than replace the contact point when it's worn. In some cases, the crystal can be replaced when it's discolored or scratched. Numbers refer to the scorecard above. (1) Crystal replacement: (see page 233 for instructions) Only the new Mitutoyo and some Starrett indicators have plastic bezel and crystal combinations which simply snap in place. You may also need to replace the rubber o-ring. (2) Contact point replacement: (see information on contact point length on page 21) Only Starrett Last Word and Gem indicators may cause problems. Girodtast, Kafer and Starrett (other than Last Word) have a set screw which may have to be adjusted for calibration. All other other indicators are hassle-free. Manufacturers may provide special wrenches or keys which can make removal easier, but you can just as well use a pair of jeweler’s pliers. (3) Spare Parts availability: Most manufacturers do not sell directly to end users. It may be necessary to order through a distributor. Distributors may not be eager to sell parts because they tend to be non-lucrative and time consuming. (5) Accuracy: All brands offer at minimum an accuracy of ± one graduation for their first revolution. Anything which claims to be more accurate is meaningless. Indicators with multiple revolutions become less accurate with each successive revolution. Since test indicators are comparators this again is meaningless. Incremental errors can be corrected to some degree by adjusting the contact point angle. (7) Response: Indicators with extended ranges have extra gears and you'll notice a minor sluggishness when compared to single revolution indicators. In practical situations this is insignificant. Interapid models 312B-15 and 312B-15V with very long points are often slower to respond because of the mechanics of the long point. (8) Magnetism: Spinning motors and magnetic fields will magnetize indicators with iron content. This may cause the indicator to stick or freeze-up. Running the indicator through a de-magnetizer will be necessary. Most indicators are iron-free for this reason. (9) Contact angle: All test indicators except Interapid are designed so that the contact point must be parallel (180°) to the measuring surface. Deviations from this will result in a cosine error which can be mathematically compensated. Interapid indicators are accurate when the angle is 12°. Starrett model 708 and 709 must be 15°. These indicators are suited to situations where the body would otherwise get in the way. Some Fowler test indicators have pear-shaped contact balls which in theory eliminates cosine error. (10) Dovetails: test indicators need to be fastened to stands or holders of one sort or another. Most models have dovetails which are integral with the indicator body. This usually means they're of the same soft brass and they'll eventually disfigure from repeated clamping and tightening. Some models have dovetails made of hardened metal which is screwed onto the body. It would appear that these are replaceable, but you won't ever have to replace them for wear: you're more likely to rip them off the body and that's probably damage beyond repair. (11) Plastics: in order to save money some manufacturers are resorting to plastic parts, including plastic gears (Mitutoyo, Peacock) and plastic bezels. We find that the all-metal indicators are more durable. Plastic bezels are quick to break. Some structural parts may be made of fiber which is quite durable and is not considered as plastic. (12) Craftsmanship: some indicator construction shows real skill in manufacturing while others are downright amateurish. There can be variations among models of the same manufacturer. Good craftsmanship does not imply excellence for the task at hand. This is more a question of aesthetics. (13) Manual vs. automatic reversal: All modern test indicators can be used in either direction (contact point goes up or down). You can take measurements from below or from above. In the old indicators (ca. 1950-1960) there was a small lever on the side of the body which you had to move one direction or the other so that the indicator point moved up or down. This switch still exists on the Starrett Last Word and some other models. Problems will arise if the switch is not fully engaged. This can easily be overlooked and is a decided disadvantage. (14) Body finish: Indicators with a painted body can be problematic when the paint starts to peel, usually due to exposure to solvents. We see this occurring in many older indicators that come for repair. Interapid has apparently switched to a better paint job which doesn't peel like the older models did. Unfinished bodies tend to get rusty. The best indicator bodies have dull chrome plating on brass. (15) Bezel rotation: Manufacturers have tried different approaches to making the bezel movable and to keep it attached to the indicator body. The newest trend is to use o-rings which have the advantage that, generally, the bezel is easy to pry off and replace. But, o-rings, while they work well when new, age and stretch and the bezel won't stay put or turns too easily and can't be adjusted. The better systems use metal springs because they don't change appreciably. They can also be adjusted (although with difficulty) to customize the amount of friction. Often times these springs are hidden from view and have nothing to do with holding the bezel onto the indicator itself. This may very well be the best solution, as in the Interapid and Bestest indicators. (16) Calibration: A few test indicators can be adjusted for calibration. Some have contact points with set screws so that, in effect, you can shorten or lengthen the point to adjust calibration. Others have internal cams that can be adjusted. Both procedures require jeweler's screw drivers, good eyes, patience and some intuitive algebraic skills. Since new indicators are factory calibrated, this feature is rarely needed by the end-user but could prove helpful in the repair shop. (17) Waterproof? : Because the contact lever has to go into the indicator body, the test indicator can not be liquid proof. However, some models offer a bit more resistance to the ingress of liquids than others because the entrance into the body is smaller thus fending off liquid sprays; and, the bezels offer a tighter seal. If liquid contamination is an issue, then you may want to consider these factors. (18) Serial Number: To comply with ISO stipulations and to make identification possible for the employer's records of calibration a permanent serial number is required to be stamped or engraved somewhere on the indicator. Mitutoyo has gone so far as to add a miniature scan code on the dial face which can eliminate errors of transcription. If the dial is changed during repairs, however, the serial number is lost. Opinions on these indicators, although based on over 50 years of experience with repairs, are nevertheless highly subjective. We welcome your comments on any of these test indicator ratings. If you disagree or have experienced problems which you would like to share please let us know.